Hey there, readers! This week I've been fussing around with mixing watercolors with other mediums. 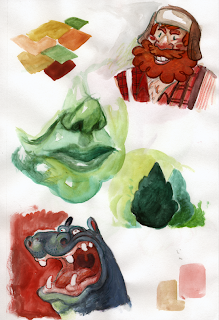 This page was the result of trying to use gouache paint along with the standard watercolors. It was also the result of falling asleep on a bus and waking up with the thought "lumberjacks are HILARIOUS! I will draw them." Here's a series of mini-paintings, all mysteriously facing the same direction. I think next time I use pen on a painting I'll use a sepia tone instead of black. Lastly, an uncomfortable man-carrot. When I was a wee lass, I felt compelled to obsessively draw anthropomorphic food. I drew reams of comics about the denizens of a fridge. Thankfully I've moved onto, well, other obsessions, but I still think vegetables are adorable. If they had cheeks, I'd pinch them!